As you’ll no doubt be aware, the World Championship Road Races are underway in Doha. The courses are pan-flat due to the terrain; however, the time trials are technical due to road layouts. This weekend sees the World’s best cyclists attempt the road races, with pure sprinters provided with their best chance to secure the rainbow stripes in years. We’ve already seen the team time trials, Junior Women’s ITT and the U23 Men’s ITT; here’s a little round-up of some of the events thus far…. Last year, Mads Würtz Schmidt took the U23 title, and returned to the start ramp this time round in defence of his title. Alas it was not to be, as German powerhouse Marco Mathis set a blistering pace as only the second rider out of the blocks, securing victory with a time of 34:08 minutes, 18 seconds ahead of his nearest rival, compatriot Maximillian Schachmann. Miles Scotson of Australia rounded off the podium 37 seconds behind the winner, dashing hopes of a German1-2-3 with Lennard Kämna missing out on third place by 5 seconds. Last year’s winner Schmidt eventually took 21st, a full 02:02 minutes behind the victor. Yet again vehicles found their way into the action, now a common feature of 2016 racing. As Mathis approached one of the roundabouts on the technical course, an ambulance which had been travelling ahead of him in the opposite lane started to cross into his path, a move which most certainly had the potential to knock Mathis from his bike. The rider, making a quick decision so as not to lose his rhythm and speed, managed to nip in front of the ambulance, tucking in behind an official race vehicle that had tried to communicate with the ambulance driver in an attempt to grant the rider safe passage. The incident caused Irish cyclist Ryan Mullen to question Mathis’s dominant ride, suggesting on Twitter that the German had benefited from drafting in the slipstream of the race vehicle. Additional controversy stalked the race as Roxanne Knetemann, participating in the Women’s TTT for Rabo-Liv, described the high temperatures as “like riding in a sauna”. The UCI had already announced before the start of the Championships that the weather conditions would be continually monitored due to unseasonably high temperatures persisting across the country. The USA’s Amber Neben rode an inspirational World Championship time trial in Doha, winning in a time of 36:37 minutes as the oldest rider in the field. Neben, who missed out on a place in the US Olympic team earlier this year, battled soaring temperatures and a technical 28.9 kilometre course to triumph over her younger rivals at the age of 41 – eight years after winning her first World Championship title in Italy. As with the U23 Men’s TT and the Women’s TTT earlier in the week, the high temperatures were concerning. Neben explained that she’d been specifically training for such conditions. “I was in California when temperatures were up in the 90s – it was probably pretty comical to see somebody riding in a rain jacket and knee warmers when it was 95 degrees outside, but I was trying to get my body to adapt”. Neben’s heat specific training clearly worked, as she took victory ahead of Ellen Van Dijk of the Netherlands, who claimed a podium spot, 6 seconds behind Neben. Australia’s Katrin Garfoot completed the podium line up, 8 seconds behind. Annemiek Van Vleuten, returning from her devastating crash in the Rio Olympics, was involved in yet another controversial incident, as if rogue ambulances and soaring mercury weren’t enough. Van Vleuten was coming up to a roundabout when Thailand’s Phetdarin Somrat, ahead of her on the course, did not move over to allow the Dutch rider through. Van Vleuten had to reduce speed which disturbed her rhythm and concentration, losing valuable seconds. Somrat, who had missed her allotted start time due to a mechanical, was disqualified from the race, compounding a frustrating day. Hannah Barnes was the best British finisher in 14th place behind Anna Van Der Breggen, with Hayley Simmonds in 25th. For weeks, participation in the TTT had been in doubt, as we reported last month. After the UCI agreed to provide start fees to all teams that entered, and stopped the event from being compulsory, there was enough interest from 10 of the 18 World Tour teams to make the race viable. In the end, the TTT proved to be a closely fought and exciting race, as the favourites for the title, BMC Racing, took on the young pretenders in the form of Belgian-based team Etixx-Quickstep. BMC have dominated the team time trial discipline in recent years, having won the World Championship title in back-to-back editions – 2014 and 2015. Prior to this, it was the Belgian team who were renowned TTT specialists, also having won two back-to-back World Championships in 2012 and 2013. Both Etixx-Quickstep and BMC were vying for a record-breaking third title. The route, a 40km course undertaken in desert heat, proved to be technical despite its pan-flat profile. Etixx-Quickstep riders Tony Martin, Marcel Kittel, Julien Vermote, Yves Lampaert, Niki Terpstra and Bob Jungels rode a blistering pace, crossing the line in a time of 42:32 with an average speed of 56 kilometres per hour. The first section of the course contained technical corners and turns, and the Etixx team proved the most adept in handling these aspects, setting the fastest time at the first split. The BMC team, made up of Rohan Dennis, Stefan Kueng, Daniel Oss, Taylor Phinney, Manuel Quinziato and Joseph Rosskopf, were 4 seconds down on the Etixx boys at this point. The straighter sections helped BMC to draw level, as both teams registered a time of 27:56 at the 27km point. Etixx lost Vermote and Lampaert as the course once again grew technical in the closing stages, meaning the team crossed the line with the minimum number of riders, the German pairing of Tony Martin and Marcel Kittel driving the pace during their turns on the front. BMC had pulled into the lead by a slim margin towards the end of the course, but Etixx-Quickstep showcased their superior horsepower under such testing conditions, fighting the extreme heat to eventually win by 11 seconds from BMC. Like the Belgian team before them, BMC dropped down to the minimum of 4 riders in what was a risky yet pre-planned move. After the race, BMC’s Taylor Phinney confirmed that the team had anticipated ending the race with “four or five riders. Everybody is deep in the pain cave by then…. strategy can only take you so far”. Like the teams in the prior events, the riders found themselves affected by the desert heat. Etixx-Quickstep’s director, Tom Steels, explained that he’d never seen his team so depleted after a TTT, testament to both the effort that had been expended and the searing hot weather. Also riding the sweltering course, fellow World Tour team Orica-BikeExchange came in third, 37 seconds down, with Team Sky in forth, 54 seconds back. The win was poignant for the Belgian-based boys of the Etixx-Quickstep team, as Tony Martin moves to his new team Katusha next season. “It’s a really emotional victory for me” explained Martin, “it was the last race for the team, and it’s become a family in the last five years…it’s a dream that came true…the perfect final for me, the perfect moment to leave the team with a fantastic memory”. Martin will be hoping to repeat his TTT victory when he competes in the individual time trial on Wednesday, although he has stiff competition in the form of riders like BMC’s Rohan Dennis and Giant-Alpecin’s Tom Dumoulin. British hopes will lie with Tour of Britain winner Steve Cummings and Movistar rider Alex Dowsett. Freewheeling takes three for three as our prediction was realised for the third day running! Team time trial World champions, Team BMC, swept to victory on the 20.9k course with a time of 23:11. 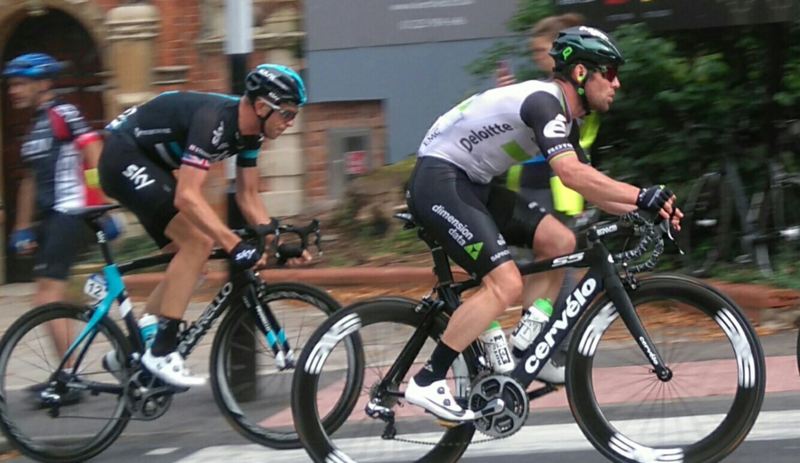 Etixx-Quickstep were the second placed team, adrift by 6 seconds. Yesterday we also predicted that LottoNL-Jumbo would put in a strong performance; another prediction that was borne out by the team’s third place in the stage, stopping the clock at 23:34. Our third ‘one to watch’ from yesterday’s predictions was the Movistar team, who placed 4th overall. The stage saw big changes to the GC, with Rohan Dennis reclaiming the top spot from yesterday’s stage winner, Peter Sagan. The Tinkoff rider drops down into 4th place, separated from Dennis by 27 seconds overall. Second place is awarded to Dennis’s team mate Taylor Phinney, by virtue of BMC’s commanding TTT performance. Etixx-Quickstep also put in an impressive time trial despite having lost Tom Boonen to a crash in the previous stage, which has catapulted Tony Martin up the standings into third place. Now that the battle with the UCI over the World Championship TTT has been resolved, it appears that BMC have been thinking about those Qatari gold medals. “This shows why we’re the best in the world” exclaimed race leader Rohan Dennis shortly after his team crossed the finish line together and looking remarkably strong. “This was a very good test for Qatar”. Etixx-Quickstep too had looked formidable – who knows what they would have been able to achieve with a full complement of riders?